Monday – Burton went to Ladybirds and it was a lovely day. When he got home we played in the garden on the trampoline mostly. Jenson was funny – he found this toy fencing and said ‘I’m a picture Mummy’! Thursday – Burton woke up with a temperature and a horrible cough and spent the day sleepy and laying on the sofa so lots of Peppa Pig was watched by him. Saturday – Jenson woke up with a temperature and a runny nose and has spent the day not doing very much. Burton is better but not well enough to go out yet. I was meant to be going on a hen weekend today but have had to cancel due to poorly boys. And that was my week in photos and words! I’m loving your crow point photo, great action photo. I hope they both feel better soon. Oh bless them, poor little dabs. I hate seeing them so weak and helpless, it knocks them so quickly and drastically doesn’t it? Love the one of Burton jumping in the sunshine. Oh my God, where’s my flipping comment gone?! I love the one on the beach, I’ve got a very similar photo of Leo doing the same a few weeks ago. I love the beach picture, I can’t believe that was this week! It’s freezing up here and we have snow!! 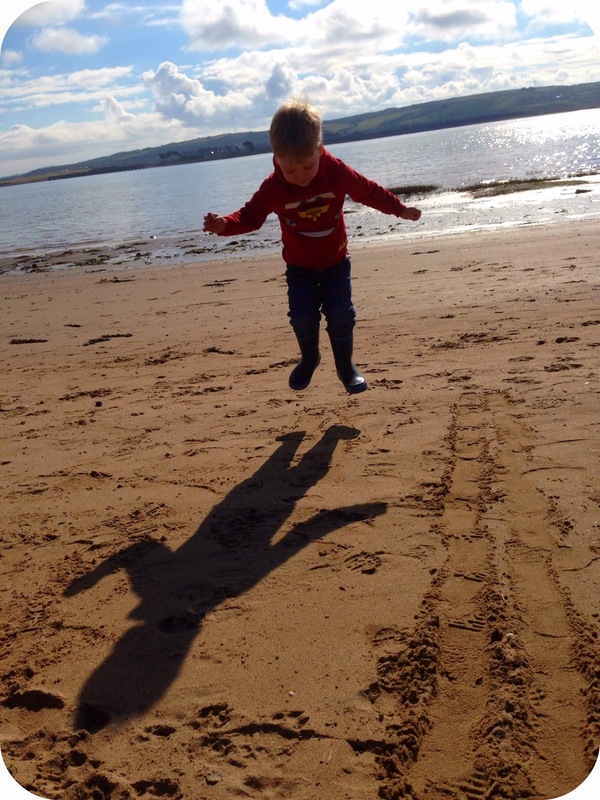 Adore the beach shot – and we have that monkey!! Love that they got outside to play with the Happyland farm. Hope Jenson is better soon – he won’t want to be ill for his birthday. H is fully recovered now (apart from runny nose). Glad Burton is bouncing back too. What beautiful pictures of your gorgeous boys! I love the jumping on the beach photo with the shadow, just perfect! The photo on the beach is excellent. I love the action shot, and the shadow. I hope you’re boys are feeling better soon. I love the shot where he’s jumping up in the air to detach himself from his shadow. Great shot! Oh I love the shadow shot on the beach! Such fun! love the picture picture. Had read about your fun day on the beach, great choice of picture. The picture is brilliant. I adore that picture on the beach! Great action shot. I hope the boys are recovered now and such a shame you missed the Hen weekend. Love the beach photo, the weather looked fantastic too!! They are growing so fast. Love the jumping on the beach pic. Hope your house is back to full health. And the picture (drawing) is adorable. I’m loving the picture which looks like he’s flying – H is very confused. “Mummy, why isn’t he flying on that picture? In fact, mummy, why is he flying there?” – ha!